"I call on the whole Swazi nation to remain united in our commitment to overcome the difficulties we face, with honesty and openness in our dealings with one another. And may Almighty God continue to watch over us as we make every effort to create the right conditions to allow all Swazis the opportunity to live in peace and prosperity." 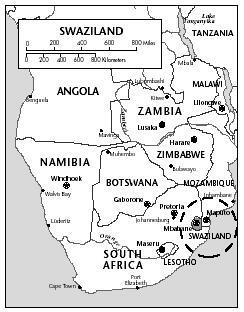 The Kingdom of Swaziland, surrounded by South African territory but for a short border with Mozambique, lies in Africa's southeastern corner. Topographically diverse, Swaziland's 17,363 sq km (6,704 sq mi) area changes from rugged, mountainous terrain in the west to low plains in the east. The population was estimated at 1,123,605 in 2002, of which 90% are Swazi, with 10% of the population split between Zulu, Tongan, Shangaan, and European peoples. Nearly 60% of the Swazis are Christian, 30% practice indigenous beliefs and 10% are Muslim. Swaziland ranks among the more prosperous countries in Africa. Even so, in 2003, an estimated one-quarter of the population was at risk of starvation due to severe drought the previous year. The sugar industry is Swaziland's leading export earner and private-sector employer. Soft drink concentrate (a U.S. investment) and sugar are the country's largest export earners, followed by wood pulp and lumber from cultivated pine forests. Cotton yarn, refrigerators, and citrus fruit are other important exports. The currency is the lilangeni .